Continuing our Easter celebrations and learning about the Easter story. 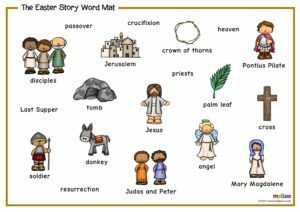 We read the Easter story using props to help us tell the story. This week we continued the story with Good Friday, Easter Saturday, Easter Sunday and Easter Monday. We have enjoyed retelling the story with our friends and when making our Easter story mobiles with Mrs Lowe. 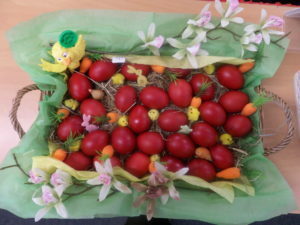 This week we also dyed red eggs, made choclate Easter nests, the girls decorated the epitaphon and we took part in our Easter liturgy in the hall. u – down under, up and down to the puddle. b – down the laces and around the foot. 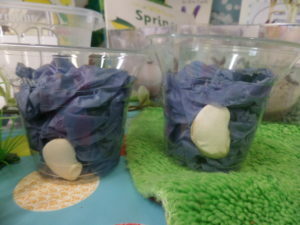 This week we we also explored growing seeds and beans. We have planted some cress seeds and butter beans and we watched them as they grow! 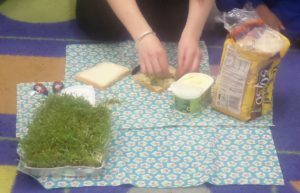 The cress grew tall and we made cress sandwiches, they were very yummy! Our beans have also started to grow into beanstalks, we are going to see how tall they will grow, we need to make sure we give them time and that they have water and sunlight. 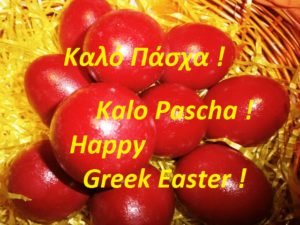 An Easter basket, with an eggcup, a red egg, an Easter chocolate and chocolate nest. Having fun with Easter. Easter counting, decorating eggs, going on egg hunts and reading Easter stories. Thank you for your support, Mrs Herne. Mrs Lowe and Mrs Bruno. Celebrating Easter and learning about the Easter story. We read the Easter story using props to help us tell the story. So far we have learnt about Lazarus Saturday, Palm Sunday, Holy Monday, Holy Tuesday , Holy Wednesday and Holy Thursday. 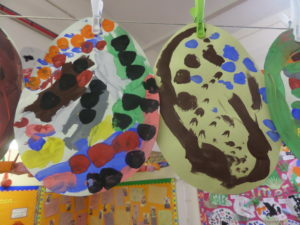 We have enjoyed retelling the story ourselves with our friends and when making our Easter story mobiles with Mrs Lowe. We will continue the story next week. c – curl around the caterpillar. k – from his head to his foot, tail, leg. 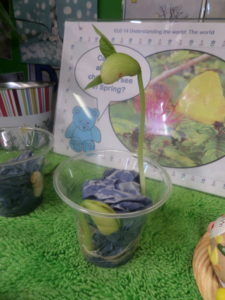 This week we we also explored growing seeds and beans. 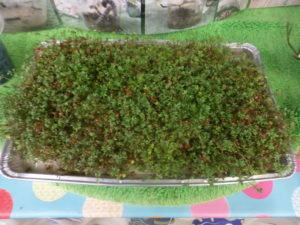 We have planted some cress seeds and butter beans and will watch them as they grow to see what happens, we need to make sure they have water and sunlight. Learning what will happen next in the Easter story. Having fun with Easter. Counting, decorating eggs and going on egg hunts! 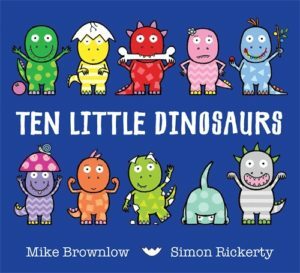 Dinosaurs – What do they eat? Finalising our dinosaur topic by learning about what dinosaurs like to eat. 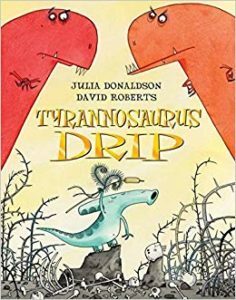 We read a story called ‘Tyranosaurs drip’, we learnt that some dinosaurs eat meat and some eat vegetables. We explored this more in the sand and made up our our stories. g – around he face, down her hair and give he a curl. o – all around the orange. 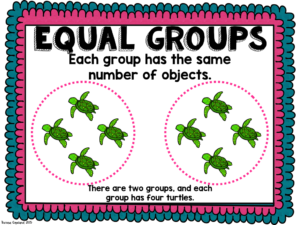 In maths we have been counting different amounts of objects and saying when the groups of objects had the same number. We have also been adding two groups of numbers together and making number sentences. 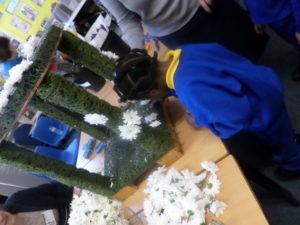 In RE this week we have been learning about ‘The annunciation’ and Mother’s day. We have enjoyed exploring what Mothers day is and why we celebrate it. Great news! Over the weekend all of our cocoons turned into butterflies! 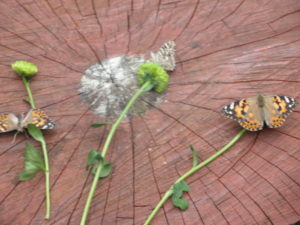 We feed them sugar water and some flowers, we then released them into the world on Thursday. We have also been learning about how things grow and we have planted some beans and cress seeds. We are going to look after them and hopefully watch them grow. 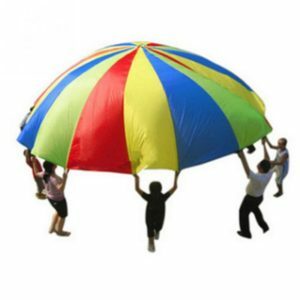 In PE this week we had lots of fun playing with the parachute! We learnt how to hold it, how to play cat and mouse and how to make a mushroom!! Learning about the Easter story. Learning the sounds c/k in phonics. 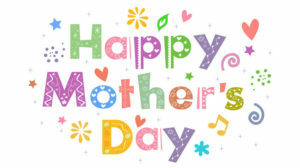 Ask the children if they can sing the Mother’s Day song to you. Please encourage the children to put their own bag and coats away in the morning, this will encourage the children to become more independent. 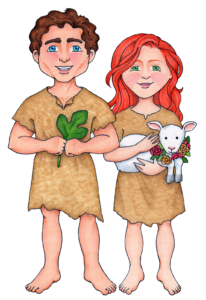 Easter lunch – You are invited to our Easter lunch on the 12th April. You would need to collect your child at 11:30 and take them to the hall for the Easter Lunch celebration. Please return your slips as soon as possible, this will inform us if your child is staying and how many lunches you will require. Thank you you for you support, Mrs Herne. Mrs Bruno and Mrs Lowe. 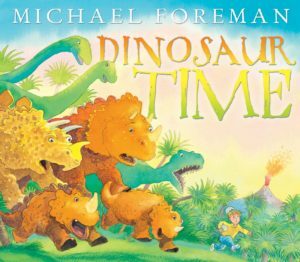 Learning about time, using the story ‘Dinosaur time’. We enjoyed listening to the story ‘Dinosaur time’, we were able to retell the story using the pictures of the main parts of the story and had fun moving to the story in PE. We then explored the stopwatches and timers and used them in many different ways. We looked at changes over time and that some things take longer to happen, we looked at our timetable and leant about what we do on each day of the week and looked at photos of our caterpillars growing and how they have changed. 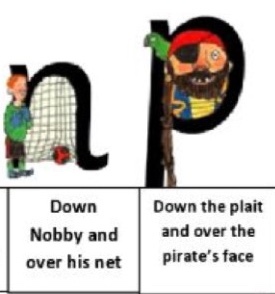 n – down Nobby, over his net. p – down his hair, up and around his face. 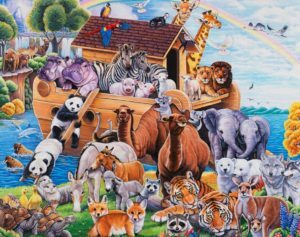 In RE this week we have been learning about Noah’s ark, a story from the bible. We watched a video story and then used the sand and water trays to tell the story. We also enjoyed painting our own rainbows, this is God’s way of telling us he loves and cares for us. 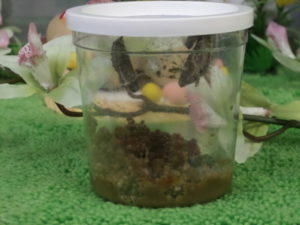 This week we have been taking care of our special egg and our cocoons. Our egg has hatched into a dinosaur! We are having lots of fun playing with him and helping him explore our classroom. We are looking forward to seeing what happens to our cocoons. 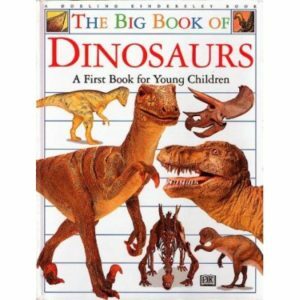 This week we have also been learning where we can find out information about dinosaurs. We enjoyed looking through our non-fiction books and talking about what we found out. Learning about the different foods that dinosaurs eat. Learning the sounds g and o. Exploring sets of numbers/objects saying when they have the same amount. Celebrating Mother’s Day and The Annunciation. Playing games and practing the sounds we have learnt so far. m, a, s, d, i, n, t, p.
Explore the changes you can see during spring. Practise how to do up zips and buttons, focusing on the children coats. Thank you you for your ongoing support, Mrs Herne. 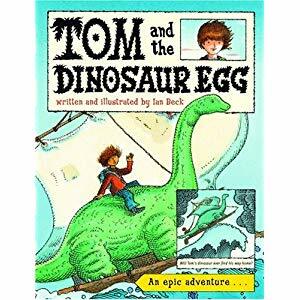 This week we read ‘Tom and the dinosaur egg’. Tom found an egg and decided to look after it until it hatched. The next day we received an egg in the post! 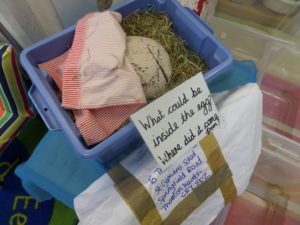 We are not sure what is inside the egg or who sent it but we are going to look after it just like Tom did. We put a blanket over the top and gave it some light so the egg will keep warm. We have been exploring eggs in the sand; thinking about size, we have been designing our own eggs and exploring which animals we think grow in eggs. In PE this week we explored how to move like a dinosaur. In maths this week we have been having fun exploring 2D shape and looking at shape properties. We looked at a lift the flap shape book and looked at everyday objects and their shape. We have also been sorting 2D shape and looking at differences between them. 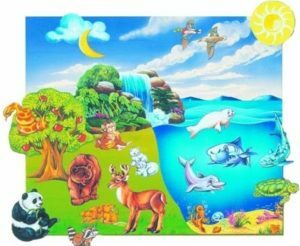 In RE this week we read ‘Adam and Eve’ and re-visited the creation story. 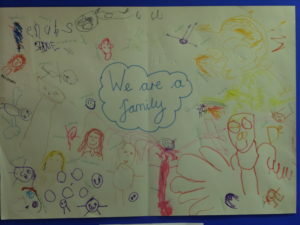 We then made our own picture of our class family. We discussed how important family is and why we love them. 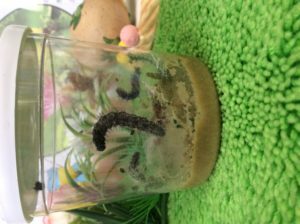 This week our caterpillars have made some big changes. They have now changed into cocoons!! 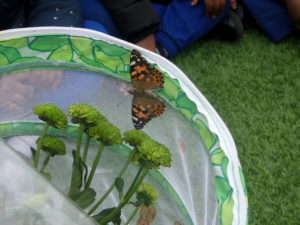 We carefully placed them into the butterfly house and we cant wait to see what happens next. Continuing our dinosaur topic, focusing on changes over time. Learning about non-fiction books and what they are. Looking at size, using dinosaur size and the food they eat. Learning about Noah’s ark during our RE learning. Please support the children in doing up their own coats and finding their names in the morning. We are encouraging the children to be as independent as possible. 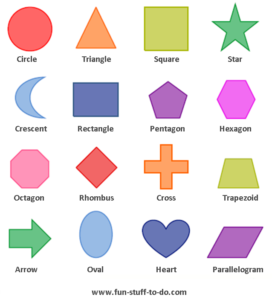 Explore 2D shape at home and talk about the shape of objects you find. Explore the sounds we have learn so far, a/m/s/d/t/i. Please keep the home learning books coming in, its great to see what the children are learning at home. 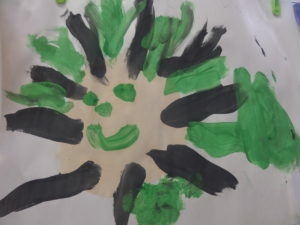 You will have noticed that we have sent home some more proud clouds, please let us know what the children have done at home that you are proud of. 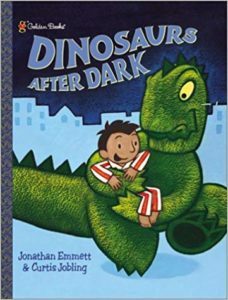 Learning about the dark using the story ‘Dinosaurs after dark’ to help us. We explored a dark cave, we needed to use torches to see where we were going and to help us spot nocturnal animals. We also have been exploring dinosaurs in the water and in the sand. In PE this week we explored what it would be like to have no sight and be in the dark. We had great fun exploring wearing blindfolds and guiding each other around the hall. 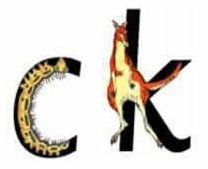 d – around his bottom, up his tall neck, down to his feet. In RE this week we learnt about Clean Monday and why we will be celebrating it on Monday. We read a story called ‘George and his new school’, we found out that Clean Monday marks the first week of leant and that there will be 7 weeks until Easter. Please use this link and share this story at home. In maths this week we used the hungry caterpillar story to make symmetrical butterflies! We learnt that symmetrical means ‘its the same on both sides’. We also played a matching game where we needed to complete the heart shape and make it symmetrical. We also celebrated pancake day this week. We had lots of fun making pancakes using flour, water and eggs. We also sang a song about how to make a pancake! 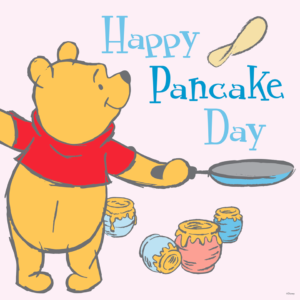 We hope you enjoyed your pancakes! 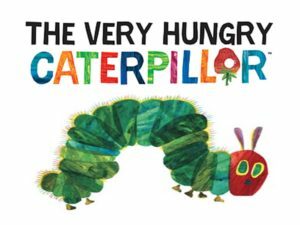 We read ‘The very hungry caterpillar’ and discussed what we think will happen to our caterpillars. 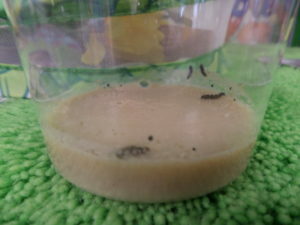 We have been watching our caterpillars grow, they are eating lots and getting very fat now! Continuing our dinosaur topic, focusing on Dinosaur eggs! Designing eggs and talking about different animals that hatch from eggs. 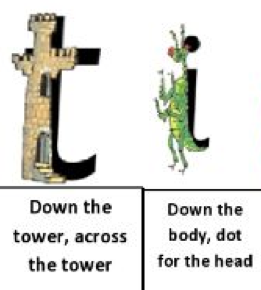 Learning the sounds t and i.
Practise the sounds from this week, s and d.
If you wish your child to have milk, it is free you just need to apply online. 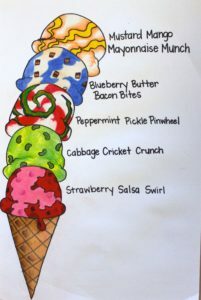 Go to ‘coolmilk’ online. World book day is 12th March. The children can come to school dressed as a book character. Thank you for your going support, Mrs Herne. Learning about dinosaurs. We read a story called ‘Dinosaur chase’, we found out that even small dinosaurs can do many things! We also looked at where dinosaurs lived and how they behaved. We used a story called ’10 little dinosaurs and dinosaur eggs and nests to help us with our counting and estimating. We were exploring dinosaurs in the sand and on the carpet with the big blocks and making dinosaur shapes using the playdough. 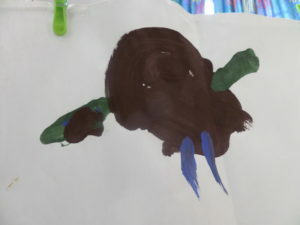 We have also been painting pictures of dinosaurs of making dinosaur collages. 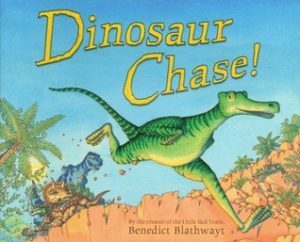 In PE we read ‘Dinosaur chase’ again and moved liked the dinosaurs to the story. 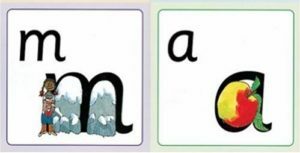 This week we have started learning the sounds of the letters. We have learnt the sounds ‘m’ and ‘a’. We have been using a rhyme to help us remember how to write the sound. m – Maisy, mountain, mountain. a – around the apple down the leaf. This week we received some tiny caterpillars in the post! We are going to look after them and watch them grow and see what happens to them. In RE this we learnt about how Jesus loves me. We now know that Jesus loves us and that he is always watching over us. 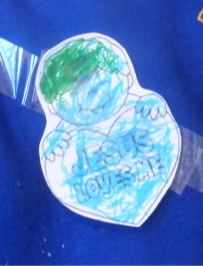 We made badges for us to wear and keep at home to remind us that Jesus loves us. Learning about dinosaurs in the dark and exploring what it is like to be in the dark. 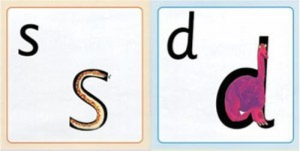 Learning the sounds ‘s’ and ‘d’. 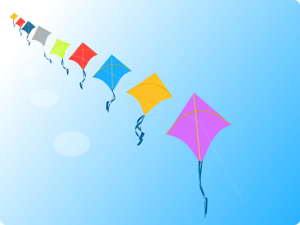 Learning about clean Monday and making celebration kites. Practise our sounds from this weeks phonics learning, m/a. Parents consultations are on Monday 4th and Wednesday 6th March from 4:00pm-7:00pm. If you would like to come and see me please book online or call the office. Learning about elephants. We have been learning about where they live, what they like to eat, what they do and how we can look after them. We learnt about a charity called WWF. They look after animals that need protection from humans and Mrs Herne told us that she had adopted an elephant for us! Our elephant’s name is Kiruba, WWF sent us some information and a toy elephant for us to play with. 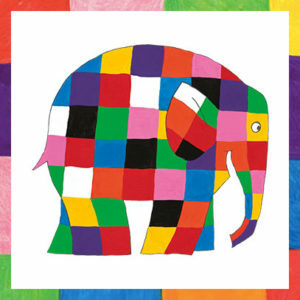 We have also been reading stories about Elmer the elephant. We have enjoyed painting our own Elmers! In maths this week we have been learning about money. We have been exploring 1p coins and thinking about what we can buy using the coins. We have been counting how many pennies we have in our purse, finding hidden pennies in the classroom and putting them in a long line. 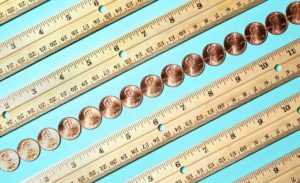 We counted how many we have and then measured how long the line of pennies was. We have been using the Beebots this week. 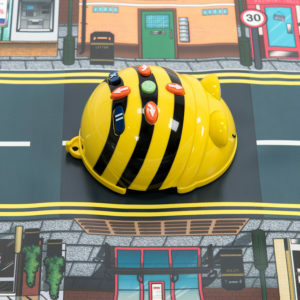 We were able to use the instructions we learnt last time to help us use the beebots safely. We also started using the big blocks to make new tracks and roads for the Beebots. 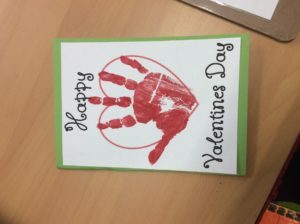 This week we also celebrated Valentine’s Day. 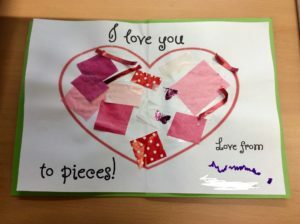 We made cards for our loved ones and drew pictures of the people we love. Learning about dinosaurs, thinking about what the eat, where they live, how they behave etc. Continuing with counting using dinosaur stories and resources. Learning about how Jesus loves us. 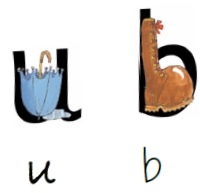 Learning the sounds of the alphabet, some of us will be learning how to make words using our sounds. 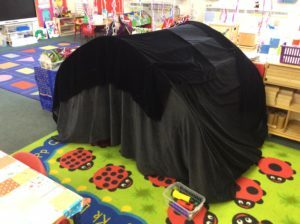 We will also see our friends from Apples and Honey Nursery when they come to visit our nursery. 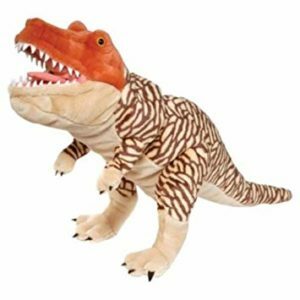 Research dinosaurs over the holiday, we will share this learning with the class. We hope you have a relaxing half-term! Thank you for all your support, Mrs Herne. Celebrating Chinese New Year. 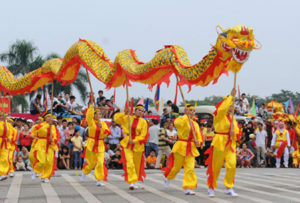 We read a book called ‘Dragon dance’ which explained how people celebrate Chinese New Year at home. We also read the Chinese zodiac story and acted out the story using the masks and finger puppets in the sand. We enjoyed playing with real noodles in the water tray and pretend noodles in our Chinese restaurant role play. 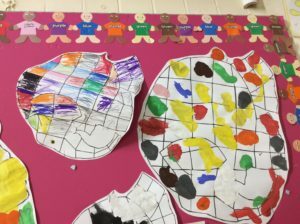 We ordered numbers to 10 using a Chinese dragon, enjoyed dancing with our Chinese dragon, explored writing in Chinese, explored making fortune cookies with the play dough and making Chinese dragon chatterboxes. 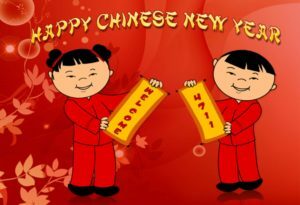 On Friday we all enjoyed our Chinese New Year party!! 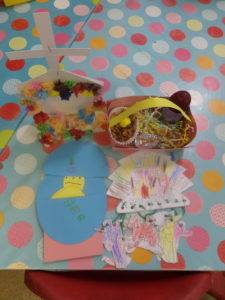 We made cakes and pancakes using Dinky’s eggs and danced with the dragon, scarves and large fan, we had lots of fun!! Exploring WWF, focusing on elephants. 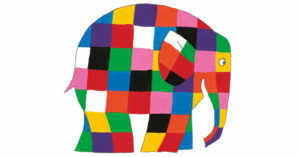 Reading several Elmer the elephant stories. Learning about money, focusing on 1p coins. Play number games, focusing on numbers up to 20. Just a reminder that the doors in nursery open at 8:40am and the children should be in class by 8:50am. We also open the gate at 11:50pm, this is our finishing time. Milk, until further notice we will only be giving milk to those children that have applied for it. The company were sending more than we needed and we were able to offer it to all children however they are now only sending enough for the children that have applied. It’s not too late, the children are entitled to free milk until they are 5 years old just use this link to apply. Please be aware it could take a week or two for the list to be updated. Learning about modes of transport you may see in or on the water. 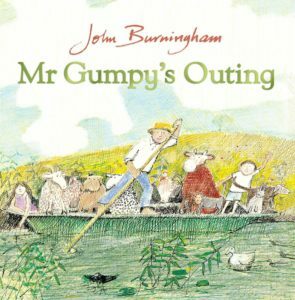 We read a story called ‘Mr Gumpys outing’. Mr Gumpy was very kind, even when the animals did not listen to him he still took them home for tea. 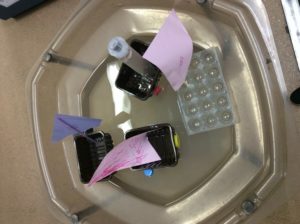 We used the boats in the water tray and the figures from the story to count how many passengers would fit into different sized boats before they sunk. We have been exploring boats in the water tray, playing a game where we needed to put animals into an ark and we made boats using the junk modelling. We then tested the boats we made to see if they would float or sink! We found that plastic was the best material, paper and card went soggy and we noticed that if we used plastic with holes it would also sink. In phonics this week we continued to find words that have the same sound at the beginning. In RE this week we finished reading the creation story. We know that God made the sky, the land, the water and then people and animals. We drew pictures and wrote about how God made the world. 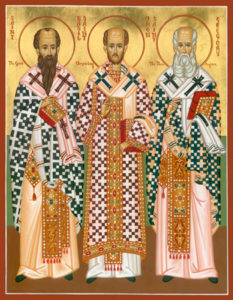 We also learnt about ‘The Three Hierarch’s’. We found out more about each of the saints and noticed that they made a great team altogether. We then started to think about what we are good at. Learning about positional numbers. 1st, 2nd, 3rd etc. Continue name writing, as of next week please help your children in the morning and practice writing their names. Practical number work, adding one more, taking one way, what happens to the number? Recording their learning in their home learning books, please encourage the children to do it themselves no matter how big or small. Even though the weather is getting colder we are still using the outside area, even if it’s just for a short time. We do have a box of hats, scarves and mittens that the children must wear when they are outside. Please put your child’s own hat, scarf and gloves in their bags ready for when they go home. Thank you for support, Mrs Herne.